Why would this suggested edit be rejected? The original answer seems pretty unfriendly to me. 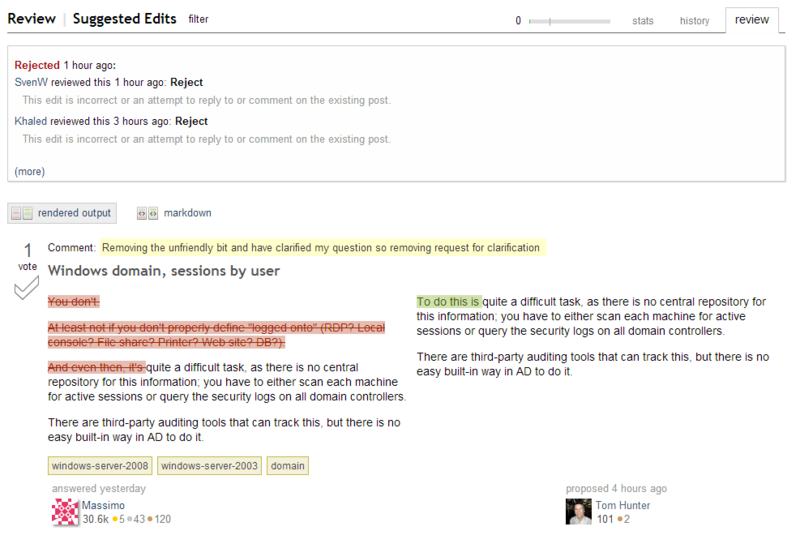 Stack Exchange sites are unique in that all content is entirely editable by the community. Because of this, there is the temptation to make everyone sound chipper and cheery. You need to avoid this for a few reasons. First of all, there was nothing wrong with Massimo's answer. It might not have been the wording that you would have chosen, but it wasn't offensive or condescending. It wasn't rude or incomplete. Editing any content in a question or answer bumps that question to the front page. This is by design so that all users can have a "fresh look" at it in case the post was defaced or spammed. If every user edited every post that they came across so that it reads as if it were written in their own voice, there would be no original content on the front page - it would be a slew of edits. Finally, it wasn't of considerable substance. Edits should address a significant error, typo, or omission in a post. Editing in links for citation where the source URL may have moved is good. Editing a command in a script where a user made an obvious typo in their answer is good. Editing an answer to capitalize a missed proper noun is bad. Editing to change the tone of a post that isn't rude or offensive is bad. It's not that your edit doesn't make it sound nicer, so to speak, it's that it didn't add any value and an edit that doesn't add value just spams the front page. Don't take it personally, there are tons of rejected edits. The answer wasn't unfriendly in any way, just a factual hint that you neglected to give the relevant information in your question. Since it wasn't unfriendly or wrong, I rejected it because it was Massimo's decision to answer the way he did and it's not your place or mine to enforce your view on his post. It's an invalid edit that changes too much of the original without improving it in any way. It'd that simple. The qualifier that you wanted to edit out is also important, as it sets context. Without context the answer loses much. If that answer seems unfriendly to you I'll ask you to stay well away from what I post. You're young, inexperienced and not a sysadmin. That means you cannot know or understand why we post what we post. Give it a decade or two and see if you don't harden up a bit yourself.